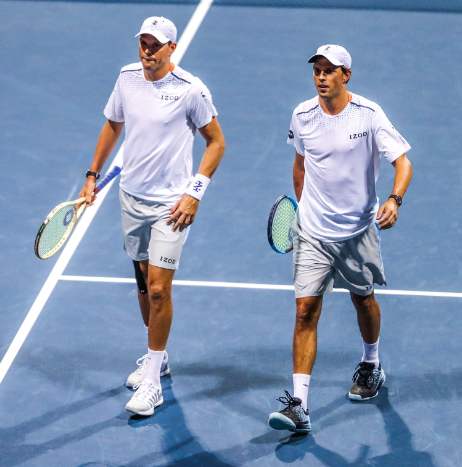 2017 BB&T Atlanta Open doubles champs, the Bryan Brothers, Bob Bryan and Mike Bryan, recorded their 40th match win at Indian Wells on Wednesday night for a place in the ATP World Tour 1000 event semi-finals. The seventh-seeded American twins had to work for their 7-5, 6-1 victory over Marcus Daniell and Diego Schwartzman. Thanks to some crafty serving, the duo saved nine of 10 break points in the 65-minute encounter. The brothers recovered from a 1-3 deficit and from 5-5 in the first set - they won seven straight games. The Bryans will next meet either Pablo Cuevas and Horacio Zeballos or Gilles Muller and Sam Querrey. They have an amazing 36-18 record in ATP World Tour Masters 1000 finals. Four-time Atlanta champ, John Isner's singles matches usually feature at least one tiebreaker, so it was only natural that his Wednesday doubles match in Indian Wells didn’t feature a service break. Isner and partner, Jack Sock, knocked out No. 8 seeds Ivan Dodig and Rajeev Ram 7-6(2), 7-6(2) in one hour and 37 minutes. Isner and Sock took six straight points to clinch the first set tie-break and five successive points in the second set tiebreaker to hold off their opponents and earn their semi-final berth. The Americans will now prepare to face third seeds Oliver Marach and Mate Pavic or Spaniards Feliciano Lopez and Marc Lopez.